Prepare well. Involve the interpreter as a member of your team. Agree business objectives to achieve the desired outcome. Do you have an operational or sales meeting that involves specialist vocabulary or detailed negotiations to ‘close the deal’? Are you exhibiting at an international trade show and need help in communicating with visitors to your exhibition stand? 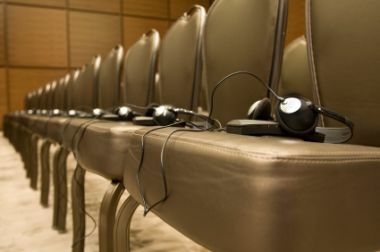 Are you organising an international conference and need to bring in professional interpreters? For the all-important meetings where you need to know that language won’t be a barrier to clear understanding, Zên International can be your interpreting partner, helping you to achieve your business objectives. For small meetings, training, business negotiation and facilitation, teleconferences and trade exhibitions. Used when attendees speak many different languages and for multi-lingual conferences. We can also help you with our conference and event management services and meet your written translation requirements.